It's been almost a year now since Rani and I started dreaming of having a Seawind 1160. This Australian-made 38-foot long (11.6 meter) sailing catamaran is definitely something that we'd love to sail together with our boys (and friends) across Indonesian archipelago. I thought I should share with you a list of sailboat charters for you scuba divers or surfers for Indonesia. 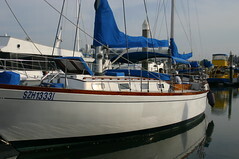 Below are some of the charter sailboats that I have found on the internet. Surprisingly, most of these attractive boats are operated by... well... Non-Indonesians! Yes, they seem to be the ones who can sell great tourism ideas to foreigners and serve them well. We Indonesians must learn from them and that also means we ought to appreciate our seas much more. Yesterday we went sailing again with Derek Mazzone on his beautiful 37 feet ketch Blue Eagle from Changi Sailing Club. Mas Judhi came with us and it was his first time sailing, too. So, he had every reason to be trigger happy and holding the lines like flying a kite! Last Saturday we chartered Turmalin, a beautiful 54 feet ketch built in Hong Kong. Our friend Puput (who is relocating from Havana to Jakarta), my parents Hindro and Tuti, and the entire Blass-Hernandez family were aboard with us on a half-day cruise around Tuas (departing from Raffles Marina). We departed shortly after 9:00am and had to be under power for the first hour seeking for favorable winds. It was only after 10:30am when 5 knots of wind came to push us southeasterly towards the tip of Jurong Island. Is Gardening Better Than Sailing? If you have to choose between sailing and... naked gardening, which one will be your choice? "All that's involved is getting naked and making the world's gardens--whatever their size, public or private--healthier and more attractive. WNGD has no political agenda, nor is it owned or organized by any one particular group. Naked individuals and groups are encouraged to adopt the day for themselves." After thinking hard enough, ocean cruise sailing is the kind of lifestyle Rani and I will adopt over a course of 5 years. Out of a hectic life exists a simple and joyful life propelled by the natural force of wind. And this video is just one of many inspiring stories we have discovered. By watching this video: "Sailing on a 42' catamaran through the Bay of Islands of New Zealand", we hope you will understand what we mean by it. We are enjoying long weekend here in Singapore with 4 days off until Tuesday. While Rani took her regular French lesson I brought Noe to visit Carpe Diem Kidz on Alexandra. We will enroll Noe there in March after Rani's business trip to Aceh starting next week. Later we went to a simple wedding celebration of Harris and Neng in Lakeside. Good food and good company, that's almost always guaranteed when you are with IndoSingMum folks. Finally, I can call myself a Competent Crew for Keelboat! From now, I can legally offer my skills and expertise to any sailboat owner who needs a crew. Technically, this means I've learned the basics of boat handling. I can be a useful member of a yacht crew rather than just another body for the skipper to worry about.